World Mission Sunday is an opportunity for churches around the world to reflect on the call to global missions through social action and evangelism. Are you ready for World Missions Sunday? Below are resources your church can use to help parishioners encounter God and grow deeper in their understanding and practice of mission. The Liturgy for Mission provides Bible readings, prayers, hymns, and thoughtful reflections and can be used to guide church worship services. 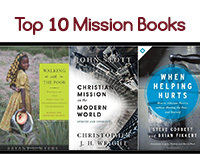 Check out our list of Top 10 Mission Books and consider using one in small group study or for personal reflection. The TalentED devotional book was produced by Five Talents with a team of pastors and Christian leaders. It provides a series of meditations on Matthew 25 and is designed to help church members grow in their understanding of work, calling, stewardship, and mission. It can be used in Bible studies or for personal devotions. Want to learn more about how Five Talents is walking alongside churches to bring good news to the poor? Check out our Christian Impact and invite Five Talents to engage parishioners, provide Sunday School materials, present a Mission Market Day, or conduct a mission round table at your church. We'd also be glad to share with you about opportunities for Short Term mission. What are your plans for World Mission Sunday? Contact us for more information and get a free church resource packet today!